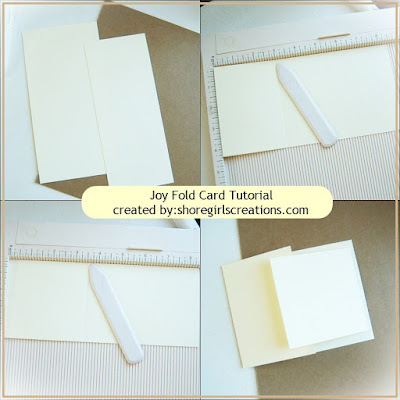 Today I’m sharing a mini tutorial on making Joy Fold cards over on the Cropstop Blog. Step One: Cut two strips of paper for your card base – #1 – 8.5 x 4.25 inches #2 – 8.5 x 3.5 inches Step Two: Score (with the Scor Buddy) and fold #1 at 3 inches Step Three: Score and fold #2 at 3.5 inches Step Four: Decorate your panels and place the smaller one inside the larger one as shown. Note: You can vary your measurements to create different shapes and sizes and even use your Spellbinders Nestabilites dies for the inside panel! For my masculine card: I chose coordinating papers from the Complete Boy (My Mind’s Eye) stack and an old dictionary page. I die cut a classic scalloped square (Spellbinders) and embossed it with the collage embossing folder from Tim Holtz. The typewriter ((Stampabilities) is stamped in Ground Espresso Distress Ink, and accented with a tiny gear and book-page roses from the Tiny Tattered Florals Dies (Tim Holtz.). I tied a bow in gold burlap string and affixed a grungy button to the left panel. Inside I added a few vellum pieces from the Tim Holtz ephemera set called Thrift Shop and stamped a small “vintage” sentiment in Ground Espresso Distress Ink. I also made a spring version of the joy fold card featuring a pretty daisy die cut from Tim Holtz tattered florals die and embossed with the Cuttlebug folder called Swiss Dots. To create the matching panels I used the Impression Obsession plaid background stamp, water color paper, Distress Inks (Twisted Citron, Fossilized Amber, Salty Ocean, Abandoned Corlal), and my Mini Mister. The “hello friend” sentiment is stamped in Mowed Lawn distress ink and pretty sequins add a little sparkle to the front. I tied a little blue twine bow on the left panel and added a button to the center. Inside features a Stampin’ Up sentiment in hickory smoke and a line of little white pearls. I’d love to see your take of Joy Fold cards so stop by the CURRENT CHALLENGE and link up your cards and projects using CropStop products! Beautiful soft shades of Spring in your second card Esther love the blue twine bow as your finishing touch. Thank you for joining us at Ooh-la-la. Love this fold, both cards are so pretty! Thanks so much for playing along at Allsorts in our "Girls or Ladies" challenge! Very cool cards! Great fold idea. Love the cog with the roses and that pretty daisy! Two lovely creations, many thanks for joining in with our 'Close to Nature' theme at Stamping Sensations challenge and also our Women's week at Allsorts. These are fabulous! Such a fun card fold! Love the interactive feel to these! Beautiful card and perfect for our challenge Spring is in the air.